If you drive up to the Griffith Park Observatory (atop Mount Hollywood), you can see more stars than you might imagine. Besides the heavenly variety (which you can view through the observatory's giant telescope), there are Hollywood stars who have left their mark here as well. 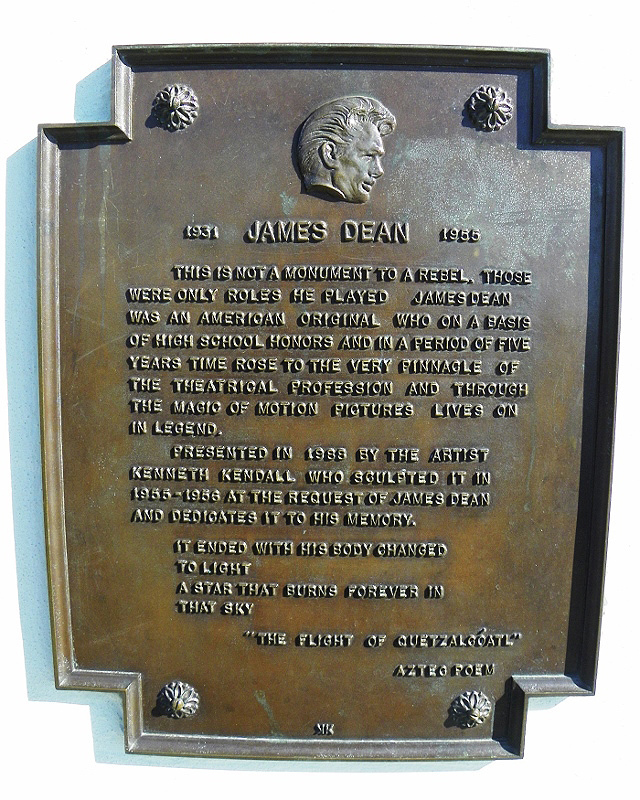 Many movies have been made at the Observatory, but one stands out: "Rebel Without a Cause," the classic 1955 film about misunderstood youth, starring James Dean and Natalie Wood. True to his movie image, James Dean lived fast and died young. 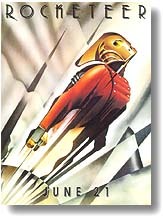 He was only twenty four years old when he was killed in an auto accident in 1955, the year he made "Rebel." He quickly became a cult figure, right along with Marilyn Monroe. 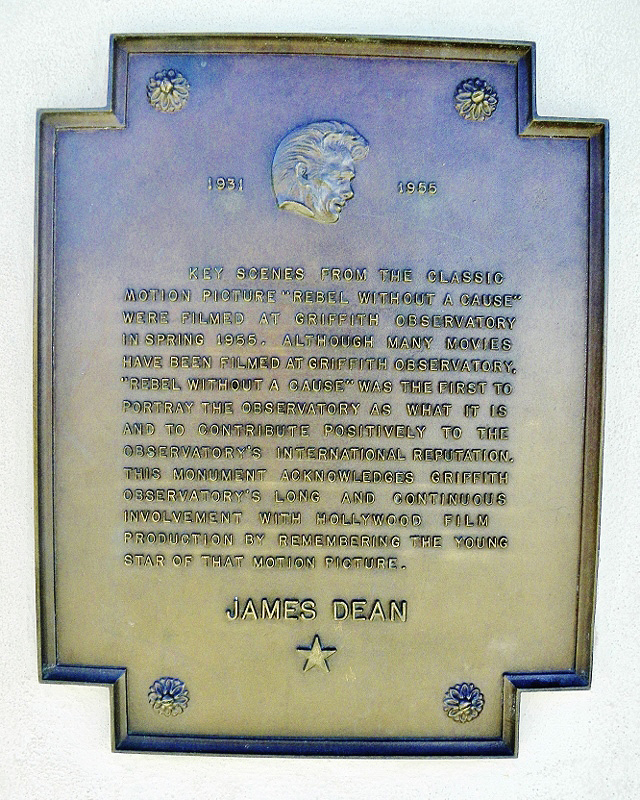 A student at UCLA, James Dean only made six films in his brief lifetime. He had only three lines in his first movie, and only one line in his second effort. Yet he went on to earn two successive Academy Award nominations, for "East of Eden" and "Giant" (the latter film was released after his death). He also won a Tony in 1954 for his performance on the Broadway stage. His life was chronicled in two documentaries, 1957's "The James Dean Story" and 1981's "James Dean," as well as the 1976 TV-movie, "James Dean." Dean had just bought a 1955 silver Porsche, when he encountered Sir Alec Guinness, Grace Kelly, and Louis Jourdan outside a restaurant. He showed them his new Porsche, and bragged that it could do "a hundred and fifty." Guinness, thinking that the sports car looked dangerous, warned Dean never to get in it, and predicted that if he did, he would be dead within a week. Sure enough, only six days later (on September 30) they pulled James Dean's lifeless body out of the twisted wreckage of his new Porsche, on a lonely stretch of highway near Paso Robles, California. He had been driving more than twice the speed limit when he crashed... Following a Quaker funeral service, he was buried back home in Fairmont, Indiana. The Griffith Park Observatory has placed a large bronze bust of James Dean just outside the domed building (on the sidewalk to the west of the main lawn). 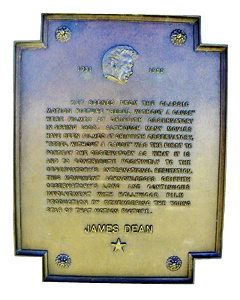 The bust sits atop a white column, which contains a gold star and the words "James Dean" written large, plus a bronze plaque commemorating the making of key scenes of "Rebel Without a Cause." They shot that knife-fight scene from "Rebel" twice. First in black & white, and later (when the studio insisted) they had to re-shoot it in color. Dean and company used real switchblades in the scene (with chest protectors under their shirts) Dean got angry when the director stopped the scene after noticing that James had been cut on the ear and was bleeding. Said Dean:"Don't you ever cut a scene while I'm having a real moment." The plaque also notes that there have been many other movies shot here outside the Observatory. One memorable film not mentioned on the plaque is the original "The Terminator," wherein a naked Arnold Schwarzenegger (playing a cyborg assassin) arrives through a time warp, walks over to the edge of the Observatory hill, and looks out across the lights of the city of Los Angeles. In the 2007 movie "Transformers", meteors (containing the robots) crash down around the Observatory, and we later see the giant robots perched atop the Observatory dome. Incidentally, as one of the highest spots in Los Angeles, the Observatory offers breathtaking views of the city below, including a fine view of the Hollywood Sign (perched atop the nearby Mount Lee, to the northwest of the Observatory). Inside the Observatory, sightseers can gaze at a different kind of stars... or listen to rock music at the popular Laserium shows. Parking: the Observatory is now back to normal, and you no longer have to make a reservation or ride a shuttle bus. You can just drive up to the Observatory again, and park in their regular parking lot. Hours: The Observatory is open Tuesdays through Fridays: 12 noon to 10 p.m., and on Saturdays & Sundays: 10 a.m. to 10 p.m (closed Mondays). Getting there: The Griffith Park Observatory is located atop Mount Hollywood, and can be reached by taking either Vermont Avenue or Fern Dell Drive to their northernmost end. 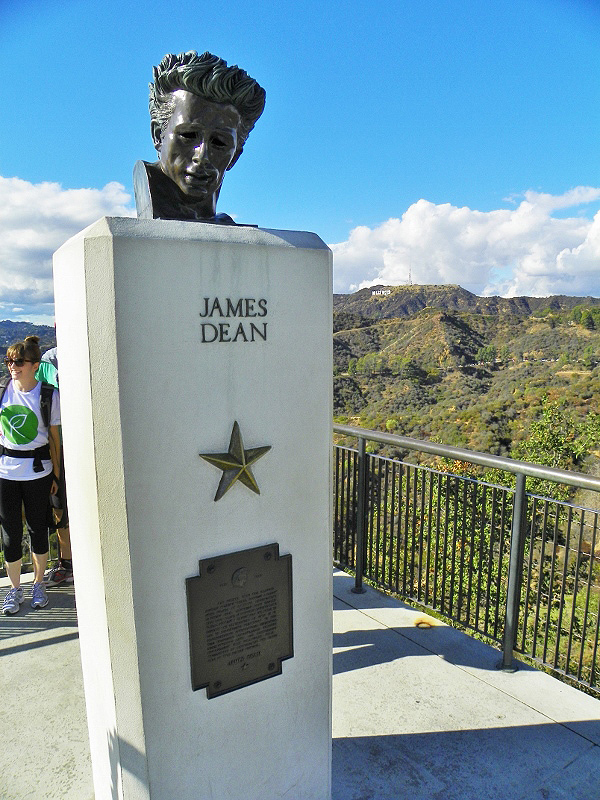 If you stand facing the domed Observatory, the bust of James Dean will be on your right hand side. / From the Hollywood (101) Freeway, take the Sunset Boulevard exit. Go east on Sunset two blocks to Western Avenue. Turn left (north) on Western, and follow it north (about one mile) until it curves right and becomes Los Feliz Blvd. Just after this turn, make a left (north) onto Fern Dell Drive, and follow the road (which is renamed Western Canyon Road) up the long, winding hill to the Observatory. / Alternatively, take Los Feliz Boulevard east another a mile and a half to Vermont Avenue, turn left (north) and follow Vermont up (past the Greek Theatre) to the Observatory.